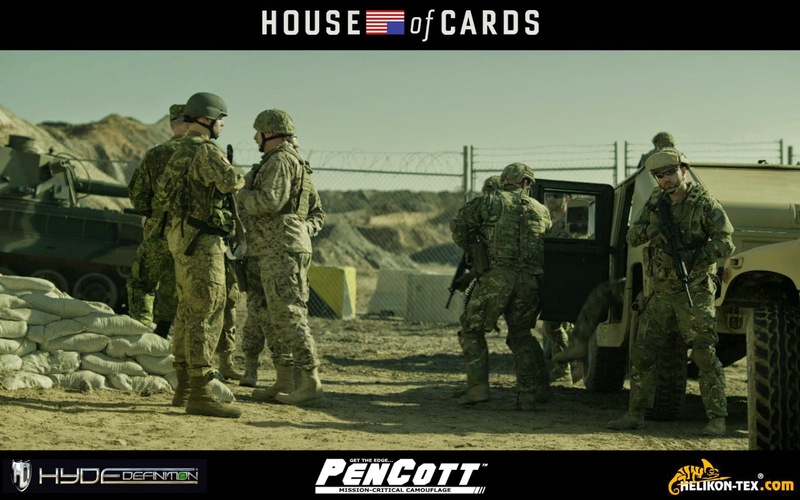 Tactical Gear and Military Clothing News : Hyde Definition PenCott BadLands and GreenZone Featured in "House of Cards"
Hyde Definition PenCott BadLands and GreenZone Featured in "House of Cards"
Seen in a crucial and dramatic segment of Season 3; PenCott™ camouflage patterns are seen in use by 'Russian' soldiers taking part in a peacekeeping mission in the Middle East. The Russian soldiers are seen wearing BadLands™ uniforms, whereas GreenZone™ uniforms are worn by the Russian officers and by Russian President Petrov. All of the PenCott camouflage uniforms used are the CPU (Combat Patrol Uniform) model made by Polish company Helikon-Tex. In the latter part of Chapter 36, US President Underwood and Russian President Petrov hold a secret meeting in the Jordan Valley to try and resolve a crisis concerning the peacekeeping mission there. 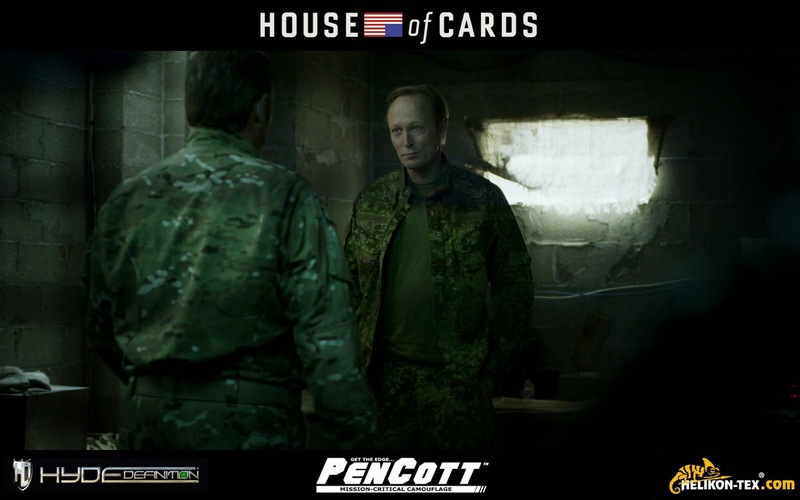 In the segment President Underwood (played by Emmy Award winning actor Kevin Spacey) wears an OCP/MultiCam ACU, and President Petrov(played by Danish actor Lars Mikkelsen - renowned for his roles in 'The Killing' and 'Sherlock') wears a GreenZone™ CPU. As real Russian Army 'Digital-Flora' uniforms are hard to come by, the 'House of Cards' costume department selected GreenZone™ and BadLands™ pattern uniforms as stand-ins. Together with help from their retail partners, and with MMI Textiles also helping to supply some spare fabric, Hyde Definition and Helikon-Tex were able to rapidly assemble the sizes and quantities of uniforms and caps that were needed and deliver them in time to meet a tight filming schedule. The shirt features armpit ventilation zippers that are accessible even when load-bearing gear is worn. The shirt also features six pockets that give plenty of space for crucial gear – plus, the chest pockets include zippers on the outer seam for easy access under chest rigs or plate carriers, and the bicep pockets also feature vertically-placed zippers on the leading edge for easier access as well. The fleece-lined stand-up collar keeps the neck of the user protected from the elements and abrasion caused by weapon slings. The CPU® pants are made with human ergonomics and tactical utility in mind and provide freedom of movement combined with high-capacity storage. The thigh pockets include a shock-cord retention system that allows them to function as emergency dump pouches. The slim front pockets can carry items such as a flashlight, a folding knife or an extra pistol magazine. The calf pockets can hold a field dressing - or an extra AR magazine that’s accessible when sitting in a vehicle. The classic front and back pockets provide carrying space for keys, wallet and other personal items if needed. The Helikon-Tex Combat Patrol Uniform® is an ideal solution for everyday tactical or field duty and comes in a variety of colors and camouflage patterns.